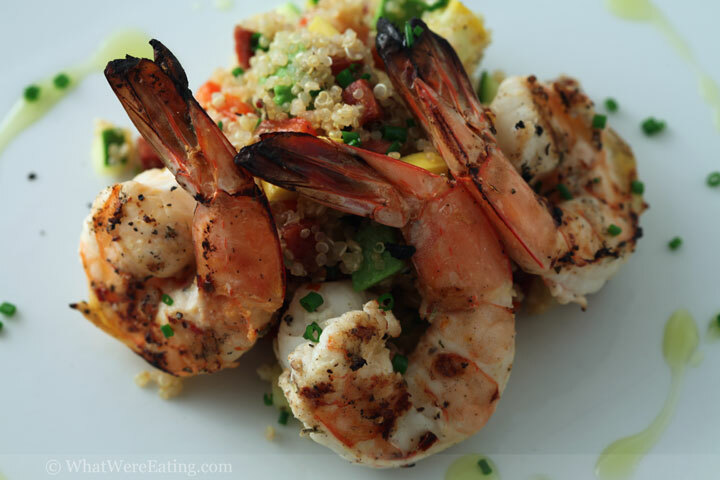 We’re eating lemon and herb marinated grilled shrimp over a bed of quinoa salad filled with diced zucchini, yellow squash, roasted red peppers, chives and linguica and tossed with a lemon-herb vinaigrette. The dish was finished with a drizzle of local extra virgin olive oil and a sprinkle of chopped chives. A long long time ago on a website far far away… okay actually more like three years ago on this same website… I used to make loads of quinoa salads. Loads I tell you. I might not have posted most of the salads I made but there was a period where Tyler and I were eating quinoa multiple times a week… for a couple of years. Moral of the story: burn out happens. Pretty much all of 2008 and most of 2009 were void of quinoa in our lives. I didn’t mind eating when it was served to me, but I had cooked it so many times I became bored with it. Fortunately I have a short memory and fickle taste buds so my burn out appears to have passed. Quinoa is officially back in my life, biatch! Oh how I’ve missed you, Lord of the Grains, and how excited I am to have you back. Place 2 cups water into a medium-sized saucepan over high heat. Bring to a boil. Once boiling add 1 cup quinoa and 1 tsp kosher salt. Let pot return to a boil then reduce heat to low. Simmer over low heat, stirring occasionally, about 20 minutes, until all water has been absorbed and the quinoa is tender yet still slightly crunchy. Remove from heat and allow quinoa to sit about 5 minutes before fluffing with a fork. While the quinoa is simmering, brown the linguica and make the dressing. Place a small saute pan over medium-high heat. Add 1/2 tsp canola oil to the pan. Once the pan and oil are hot, add the linguica. Saute over medium-high heat, stirring frequently until most of the fat has rendered out and the sausage has browned, about 5 minutes. Remove from heat and drain oil. Set aside. Place first 6 ingredients for the dressing into a large mixing bowl. Whisk to combine thoroughly. Slowly drizzle in canola oil in a small stream while whisking vigorously to form an emulsified dressing. Once the quinoa has cooled and been fluffed, add to the mixing bowl with the dressing. Add browned linguica, zucchini, yellow squash & roasted red pepper to the bowl. Toss thoroughly to evenly distribute the ingredients and the dressing. Taste then adjust seasoning as desired with kosher salt and freshly cracked black pepper. Cover and place salad in fridge to chill for about 30 minutes. Remove from fridge. Stir in chives. Taste once more to check for proper seasoning then adjust as desired. Serve chilled or at room temperature. Enjoy! Tip: This salad can be made up to 24 hours in advance as long as it's kept refrigerated until ready to serve. While the shrimp are marinating, prepare a grill to medium-high to high heat. Remove the shrimp from the marinade and drizzle with canola oil, lightly season with kosher salt and freshly cracked black pepper, then toss to evenly coat. Place directly onto the preheated grill. Grill shrimp about 2 minutes per side (4 minutes total), or until no longer translucent and just cooked through. Remove from heat and serve immediately. Enjoy! Yum! I’ve decided I’m going that my goal in the next few months is to force myself to love shrimp. Or at least like it. So feel free to invite me over next time you make something like this! you have an open invitation to come over for dinner any night of the week! you know that! you just have to WANT to come over. 😉 ps-shrimp are delicious. Thanks so much, Geneva. I love oysters too! I will promise to give you some oyster recipes in the future. Do you like both raw and cooked oysters? Let me know your preference and that’s what I’ll work on. With minimal changes, such as using fresh herbs and a light saute of the shrimp using the same fresh herbs and lemon juice, this was a very satisfying recipe. The salad and the shrimp are both good enough to stand on their own. My husband raved and said that it is mandatory that I make this again. LOVED this recipe, just made it and got rave reviews. The marinade was excellent, thanks for the post!